The winners of the 2010 Annual CanadaVet Pet Photo Contest have now been decided and we are happy to be able to announce who they are! Thank you to everyone who participated in this community pet event and congratulations to our winners. We have all thoroughly enjoyed sharing and voting on all of these great pet photos! Also, we would like to announce that we have heard your suggestions and we will be running our next annual pet photo contest in March next year, with special prizes for themed photos such as Halloween, Thanksgiving, Christmas and New Years. The holiday season is a time when we are all taking plenty of photos with our friends, family and pets anyway, so we have decided that early next year will be a perfect time to run the contest. 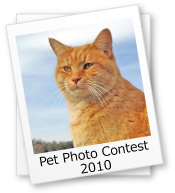 So be sure to get lots of photos of your pets in the coming months to have them ready to submit in March 2011! Click here to view the winners of the 2010 Annual CanadaVet Pet Photo Contest.